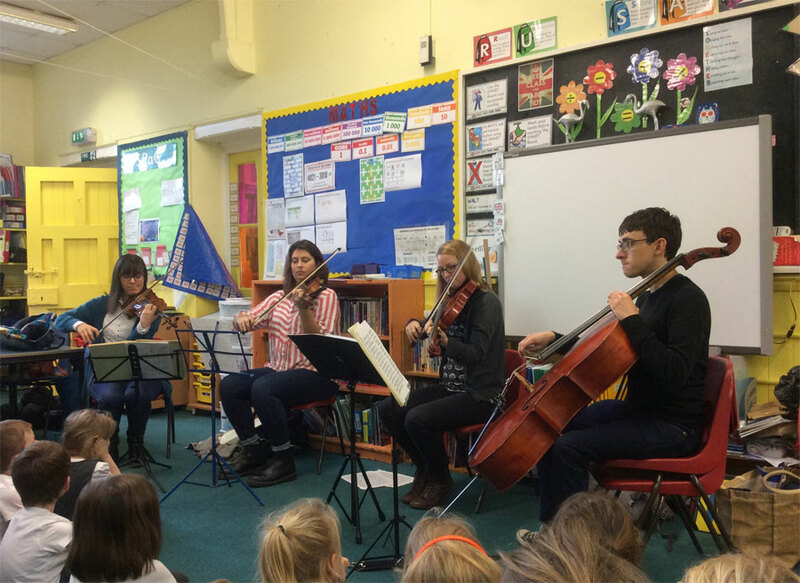 Trewidland was delighted to welcome Florian Quartet in to school recently to play to our students and help them explore their creative responses to music. The group, who were touring Cornwall with the aim of bringing classical music out of the concert hall, performed a complex piece by Haydn, before breaking it down and working with the children on their responses to it. Class 2 were tasked with constructing a story based on their feelings of listening to the music, engaging their imagination and curiosity. Class 1 were also invited to watch Florian Quartet perform, as well as ask some great questions about both the music and the instruments being played. Trewidland will be welcoming back Florian Quartet in the Spring and Summer terms to continue to inspire children to play an instrument!